By now, most of us have either seen cauliflower crusts all over Pinterest, or we’ve taken the plunge and made one ourselves. With enough cheese and herbs, they can actually be quite tasty, and a great pizza crust option for our gluten-free friends. We bought two crusts, which are sold frozen, and tried it two ways: plain, and with margherita pizza toppings. We baked the plain crust directly on the oven rack (per the instructions), and were surprised it barely took on any color in the oven. We slid it under the broiler to try and force some browning, but the entire floppy disk stayed pale as a rice cake. Then, we took a bite—our first and last. The plain crust tasted like a flavorless rice cracker, with an unpleasant aftertaste. The box actually encourages you to try it plain, “for snacking.” We prayed some cheese would help its cause. 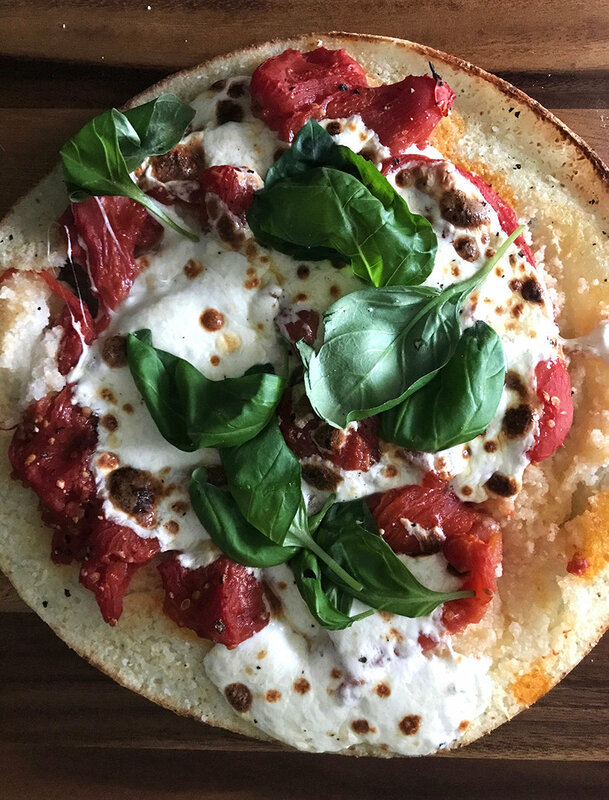 We topped the second unbaked crust with drained whole peeled tomatoes, lots of fresh mozzarella, some shredded Parmesan, salt and pepper. This time, taking it out of the oven was a hot mess. The flimsy crust buckled under the weight of our toppings, falling apart when we tried to slide it off the rack. Two people and three spatulas later, it somewhat successfully landed on the cutting board. After a topping of fresh basil, we cut ourselves a slice, only to immediately regret taking another bite. No amount of cheese can save this poor crust. If we had liked it, we would have been disappointed at the serving size, which is one-sixth of the pizza, or one sad slice. Our advice to you: If you’re looking for an alternative to a traditional crust, we recommend making it yourself. Or, if you’re excited about cooking with cauliflower, try one of our three genius ways to transform cauliflower rice.